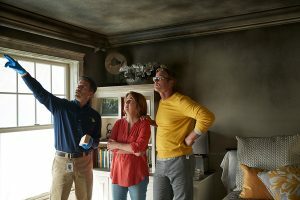 You are here: ServiceMaster DAK > Blog > Why Does My Fireplace Smoke and What Should I Do? Building a fire in your fireplace and cozying up to the comforting warmth it provides is a great way to end a long day and get through a chilly night. However, you may find that what should be a relaxing time ends up as a concerning situation if your fireplace begins to smoke. Instead of enjoying the warmth of the fire, your fireplace is emitting smoke and fumes. Not only does this pose as a safety concern to you and other inhabitants, but it also poses a threat to your property. As more fireplace smoke enters your home, there is a greater chance that your property will suffer smoke damage. Even if you open doors or windows to let the smoke escape, some of its particles will seep into your property and belongings. These particles are very fine, so they become absorbed and allow the smoke odor to linger in your home. If you have an issue with fireplace smoke when using the fireplace, then there’s an issue concerning your chimney or flue that needs to be addressed. Some of the issues are an easy fix, but others may be more difficult to solve. 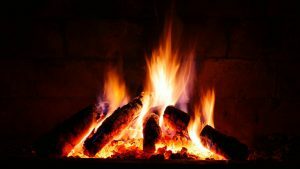 Read on to learn how fireplaces smoke up, what causes fireplace smoke, and how to resolve the problem. When you start a fire in your fireplace, your chimney or flue is supposed to pull up the smoke and gases from the fire by creating an updraft. This will prevent the smoke and gases from entering your home, thus leaving you only with the warmth of the fire. But if the chimney or flue fails to properly pull up the smoke, then the fireplace smoke instead enters your home, and there are several reasons this may occur. What Problems Cause Fireplace Smoke? If your home’s chimney has been designed poorly, it can cause smoke to enter your home when the fireplace is in use. One example of a badly designed chimney is one that is too short in comparison to your home’s height. Creosote can build up in your chimney, which accumulates over time. The chimney will become blocked by this creosote accumulation if there’s enough of it. This then causes the fireplace to constantly smoke when it’s being used. To fix this problem, seek the help of a chimney professional. They will do a chimney sweep and rid of the creosote blockage. Sometimes, there can be a chimney blockage from a bird’s nest. This is a common situation for homes where the fireplace is sparsely used. If this is the case, a chimney professional can address this problem as well. 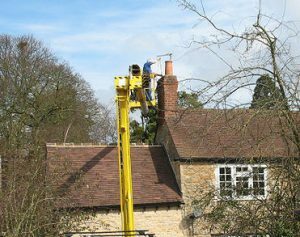 Even if you don’t have any sort of chimney blockage, you should still have your chimney inspected at least once a year. This ensures that it remains in good condition and will prevent it from causing problems for you, such as fireplace smoke. When the flue is cold, the fire will burn slower. The cold can cause smoke to go to the fireplace and enter the home instead of rising up to escape to the outside. The same thing can happen if there’s cold air in the flue causing a blockage. If your fireplace starts to smoke up when you ignite the fire, then this could be the result of a cold flue or chimney. Whenever you want to use your fireplace, the first thing you should do is check the damper. You want to make sure that it’s not closed. Otherwise, the closed damper will allow smoke to enter your home, and its odor will linger on your property. Even if the damper is partially closed it can cause smoke to enter your home. The wood you use in your fireplace is important to consider. Wet wood produces more smoke than drier wood does, and the amount of smoke it produces is too much for a flue to handle. As such, the flue will only pull up as much smoke as it can handle, and whatever smoke it cannot handle flows into your property where it can cause damage. The same thing happens when you use wood that’s too green. How Do I Clean Smoke Damage from Fireplace Smoke? When dealing with smoke damage, get professional help to ensure thorough cleaning. ServiceMaster DAK provides fire damage and smoke damage restoration services in which our technicians will clean up and repair the effects of the smoke. When smoke enters your home, its fine particles will settle onto your belongings. The smoke odor becomes absorbed by various materials, and the smell is not easy to eliminate. Because of this, professionals should conduct the cleaning. If you use home remedies to do the cleaning, it may be insufficient. Our professionals at ServiceMaster DAK have the specialized deodorization equipment and products to effectively remove the smoke odor from your property and belongings.